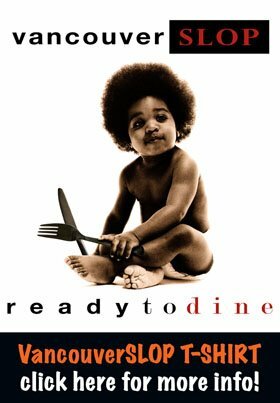 CROISSANT SLOP: THIERRY, FOOTO DELIGHTS AND BAGUETTE & CO. 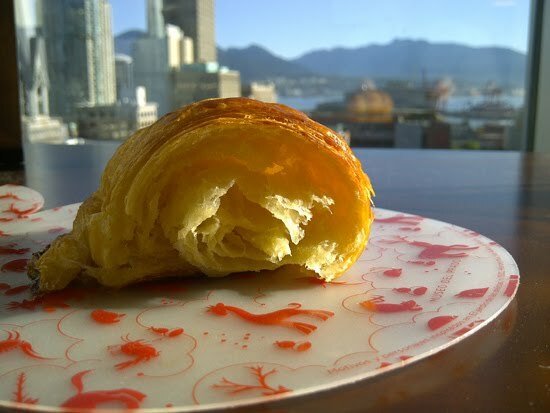 It's been awhile since our last Croissant Slop posts, wherein we disobey all medical advice and seek to destroy what remains of our arteries with the most delicious croissants the GVRD has to offer. Forgive us for our time off: the extra pounds this little experiment has left us makes all the travel time between stops that much more arduous. This latest addition to the Top Table family (Araxi, Blue Water, Cin Cin, West) is also the newest patisserie in town. Helmed by namesake pastry chef Thierry Busset, the place has received a rash of inconsistent reviews, despite being one of few dessert places that is (a) licensed and (b) open until midnight, which frankly works well for our other priorities (drinking, staying up late). Butteriness: 3.5 to 4 out of 5. We've had a number of Thierry's croissants, and each one was slightly different than the other. As with all baking, the general edict is true: the morning croissants were better than those offered later in the day. Overall, though, the butteriness here is generally subtle, and on average most of the croissants we had felt like something was missing. Flakiness: 4.25 out of 5. If there's one thing Thierry is consistent on, it's the multi-layered flakiness of all their pastries. No matter what time of day, each croissant we had hit this well on the head. Lightness: 4.25 out of 5. Hey, when you still have room for a apricot danish and a macaron after finishing a croissant, that can't be bad, right? Certain locations just seem doomed for business, and Footo Delights is the latest one to slug it out on Homer and Robson. Run by a PICA baking grad, the not-quite-a-bakery shop offers a grab bag of baked and non-baked items (croissants, fro-yo, soya milk, chocolate covered strawberries), in that sort of throw-it-against-the-wall-and-see-what-will-stick kind of way while it gets off to a slow start. During its fixturing phase, I could've sworn the signage read "Footo Croissant" at one point. Though it no longer appears in its name, croissants are definitely the main featured item. They're made on site and churned out daily through the day, a miracle of sorts given the shop's extremely tight dimensions. Butteriness: 5 out of 5, but sadly to its detriment. The Footo croissant is so infused with butter that it ends up being overly oily, to the point where one should not consider eating one without a Tide stain pen in close proximity. Flakiness: 3 out of 5. Though the exterior is as it should be (particularly with that much butter having been washed over it), the interior of the croissant is gummy, almost as though it hasn't been baked enough, and the whole thing seems at odds with itself. Lightness: 3 out of 5. Eating what feels like a gummy pound of wet butter really sticks to the ribs. Outside of downtown, Baguette & Co. serves up baked goods and pastries in Kitsilano, generating a fair amount of neighbourhood buzz through the year that it's been open. It fits well in that community, with that feeling of familiarity that entices patrons across a broad spectrum. Butteriness: 4.75 out of 5. If Thierry's croissant was lacking that je ne suis quoi, it can be found at Baguette & Co. On average, this croissant is richer in flavour, regardless of the time of day. 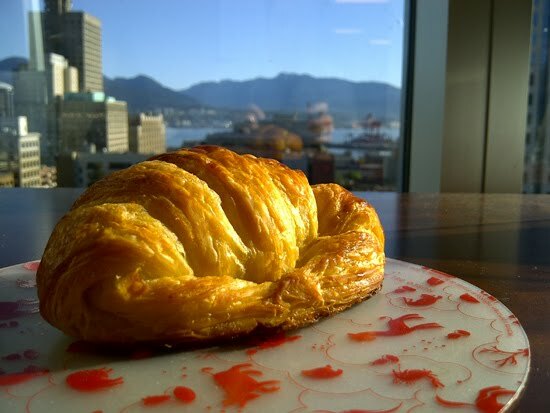 Now that Steeve Raye has morphed into Regalade Cafe, Baguette & Co. would likely be considered the reigning croissant champ of Kits...if it weren't for the Thomas Haas up the street. Flakiness: 4.25 to 4.5 out of 5. We bought our croissants in the mid-afternoon on a hot summer day, which perhaps didn't help matters much, but Baguette & Co. still brings thousands of flaky golden layers to the game. I'm thinking a visit in the morning - or more fresh batches through the day - would elevate that score right up to 5. Lightness: 5 out of 5. Offers the perfect 5 minute escape from drudgery that a croissant should; any heavier and you've got extra baggage for the day.